We can make those openings made all out of aluminum and rivets so they are light and solid as they should be! Here is one of the 1st of many Airstream concession here in Austin TX called "Hey Cup Cake", right on South Congress, now he has a few of those trailers all over town. Well those cup cake are pretty delicious. That crowd looks like that pretty much all day long! All day! Here is another shot another time, quite amasing to see! 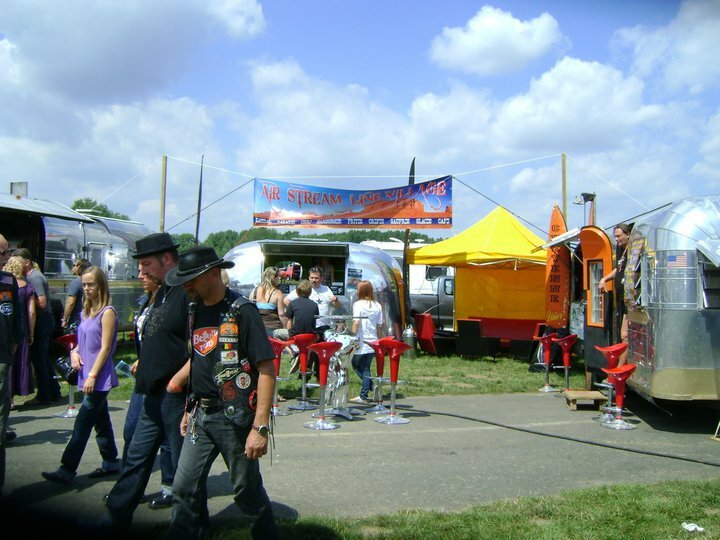 Such a succes that someone else got another Airstream right next to them a few month later. 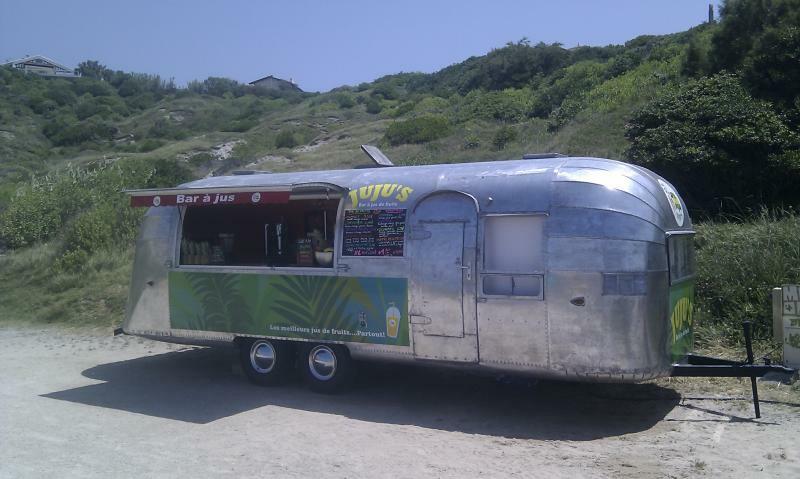 This one is just use as advertisment for a realstate Co.
Airstream that is somewhere else now ! 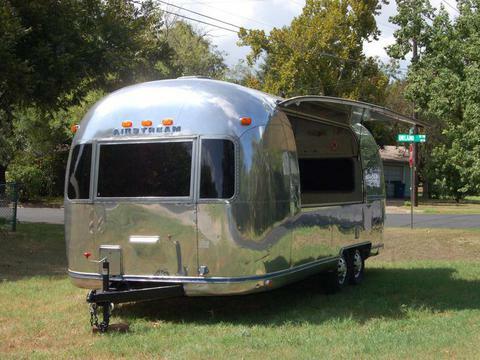 Airstream that is making ice cones on those hot summer days, here in Austin TX. Avion where they make great crepes! For this 1980 Caravelle it was the first Airstream I bought and saw in the US with an opening a few years back, bought it and was sold to Bruno on the South East part of France, he is doing pretty good with selling is Goodies of the Lyon region. We found this 1961 Bambi, I just did the opening, she and some friends did a frame off in a few days, she polished it and she sure is enjoying her own business that is growing and growing at every event, Crepe is the word! 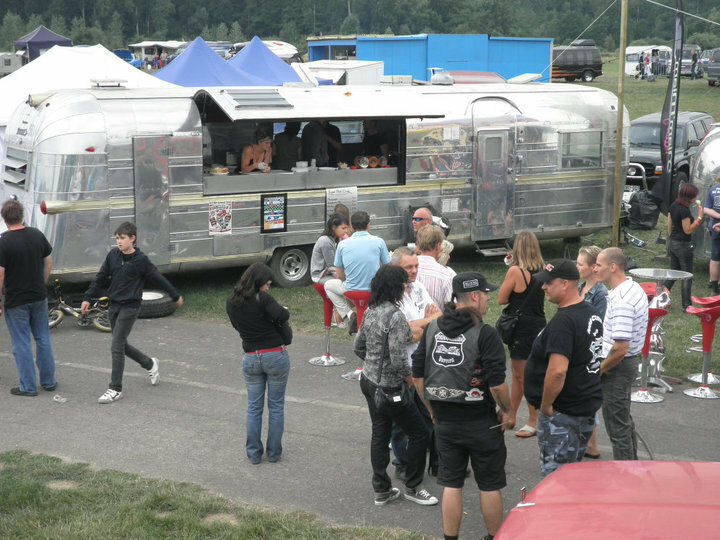 She does events with 2 other vintage Streamline concession trailers, sold by Airstream-connection. See those other one down the page! For Michel we found a 56 Airstream that already had a frame off restoration, I did the opening, put two new axles, 4 new tires and rims did the rewiring for the running lights and sent it on his way to France where he started making Smoothies to refresh the French summer crowd on the south west beach coast of France. Wish I was there in the summer! Jacques wanted a 31 footer with two big openings, this one was already polished. We gutted it did, made the 2 big openings, he did the interior and it looks amazing. Frame off restauration, frame has been cleaned, fixed repainted, new subfloor 3/4 inch instead of the original 1/2 inch that was in there. New paint on the interior. Here are a few of the many Airstreams concession here in Austin Texas, all those are just pictures I took from those trailers, I didn't even have anything to do with making openings or selling those here. They sure are poping up all over the place, there must be another 30 of those now that I don't have pics for yet. 1964 Streamline 33 foot, sold to Franck in North of France. It was a trailer that needed a lot of work, thing that was taking care of by Franck, he also did the opening him self( being a welder), there are 3 of them, 1964 33' Steamline, 1966 24' Steamline and the 1961 17' Airstream Bambi all with openings who bought a trailer through Airstream Connection that are doing the same events with different food, and people love it! 1966 Streamline 26 foot, is the first trailer I brought back to France so I could stay in it during the summer season while I was working there, I eventually sold it to Guillaume my 1st customer that is a good friend now as are all my customers. He did the opening much later after he bought it with the help of Franck. And he Franck and Viginie goes sometime to the same events and just that is a big event! 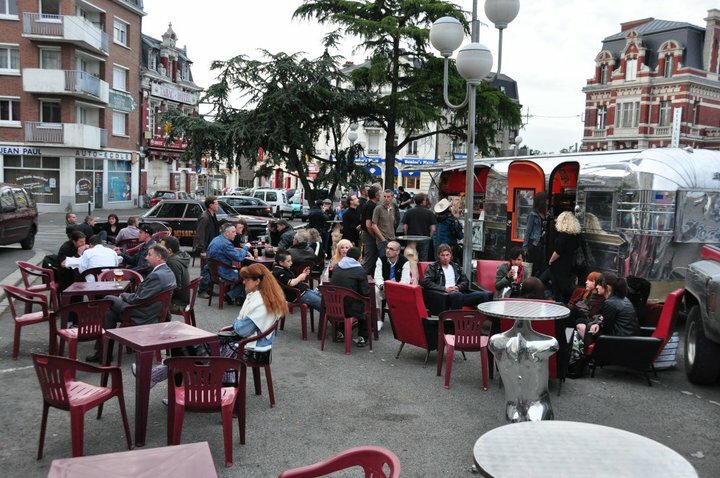 : ) Check the pics below, in North of France somewhere! We did all the custom work on the openings, fixed part of the frame, floor, changed the wheels to aluminum ones, polished it, etc... And Pierre, his right hand in France did all the designed and work on the inside. 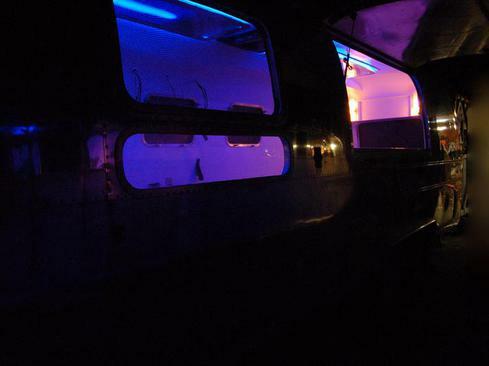 The Airstream Bar was sitting on ''Les Champs Elysées" this winter for the Christmas Markets and I hear it will be at the next Monte Carlo race for "the Grand Prix of Monaco" . 1971 Airstream Tradewind de 24' Made as retro diner for Thierry in France. We gutted it, painted the inside walls, custom made all the bar curbed dinette, made the upholstery, polished it made an opening on the side and Voila! Pretty cool lil' trailer. 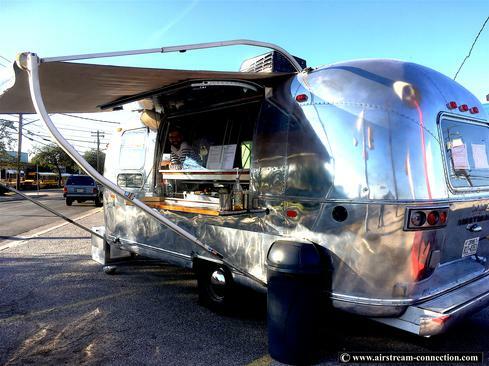 This is a 1976 28 ft. Airstream Argosy Food Concession trailer. Sold this trailer 4 years ago, the owner has used it as pizza truck. 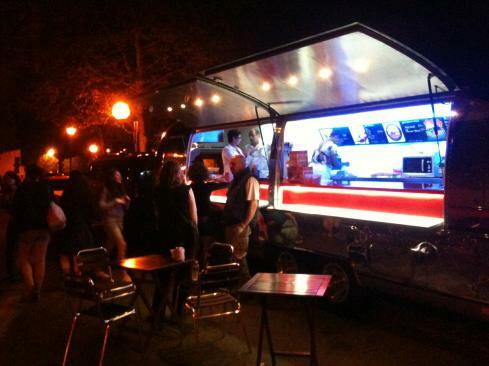 After 4 years of food trucking, he is ready to sell it. Has a 220V 50 amp plug and cable. Still needs some finishing to your specs! 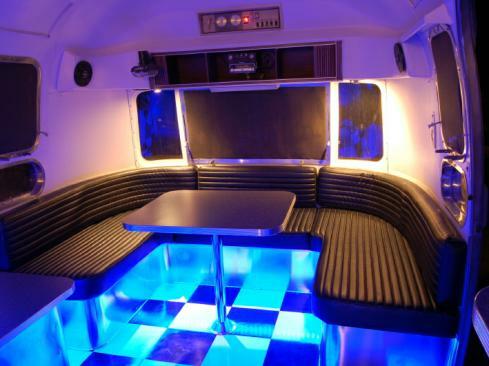 1969 Airstream Globetrotter, you can design the interior to your dream. Great condition! Trailer for sale or rent! 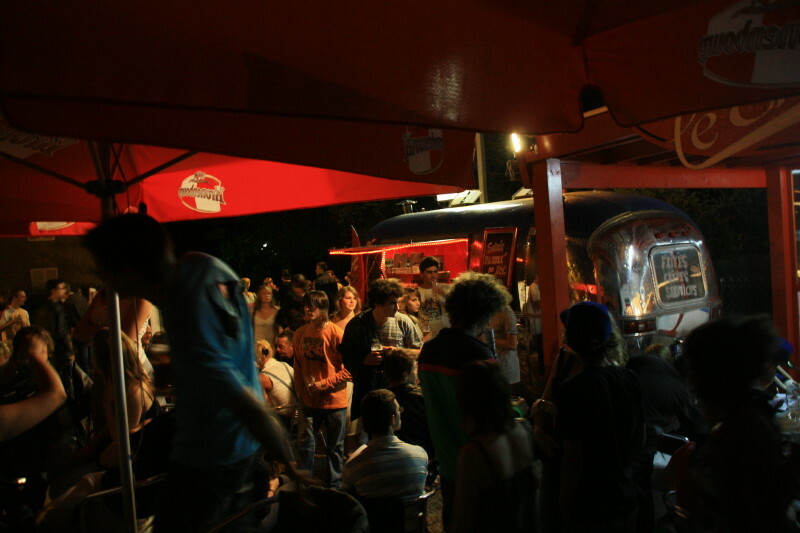 Great business advertising tool during events like SXSW, ACL Austin city Limit any event at the Austin Convention Center or any other events. It is right here in Austin TX. Airstream Food truck gutted and polished, clean with frame and subfloor worked on with a nice conccesion opening waiting for rubber kitchen grade surface floor mat to install inside . 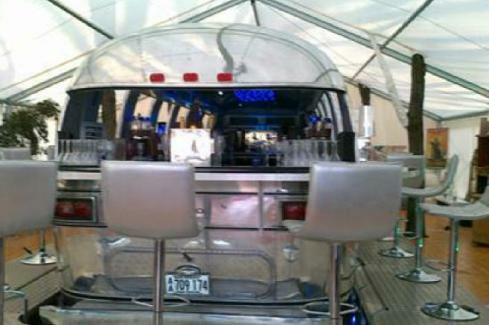 This is a 1976 27 ft. Airstream Overlander Bar/Food Concession trailer. This one is a 76 Overlander, 27 footer. One that looks good from a far but is not far from being good ;) Meaning that their are too many of those Airstream food truck that have bad bones, (bad rust on frame, you can see the whole trailer sagging, and there are no finition work. Well it ain’t easy to make them look good and be a good trailer.